Noravank Monastery is situated deep in the Noravank canyon, and from a distance appears to be perched high on the flat surface of a rock, nestled into a majestic mountain. Built in place of an ancient cloister, it grew in the reign of Princes Orbelian of Syunik. 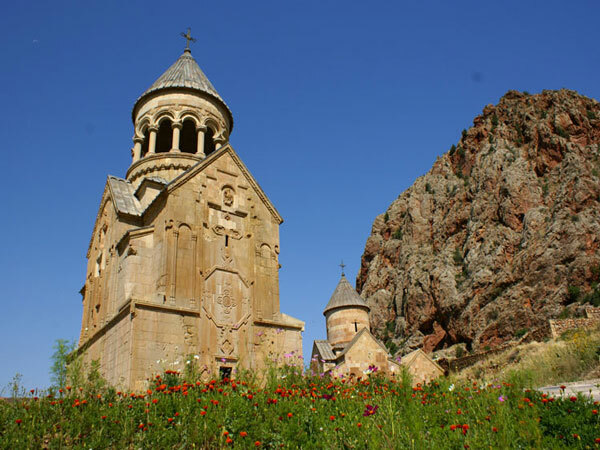 In the 13th-14th centuries the monastery became a residence of Syunik's bishops. It is the regional religious center founded by Bishop Hovhannes in 1339. The relief sculpture over the doors depicts Christ flanked by Peter and Paul. 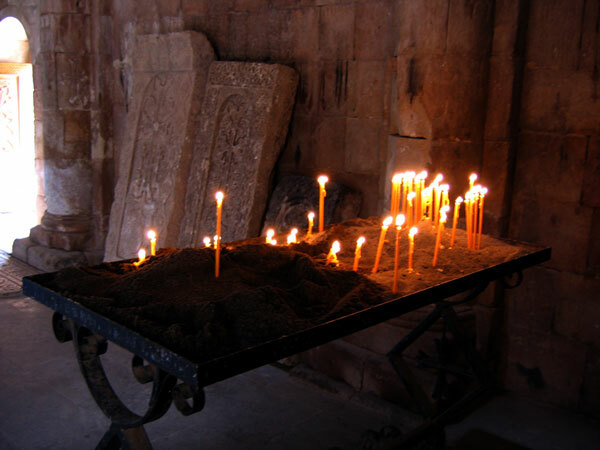 According to legend, Noravank housed a piece of the True Cross stained with Christ's blood. The church of St. Grigory (the burial place of the Orbelians) was added by the architect Siranes to the northern wall of St. Karapet church in 1275. This is a modest structure, rectangular in the plan, with a semi-circular altar and a vaulted ceiling on a wall arch. 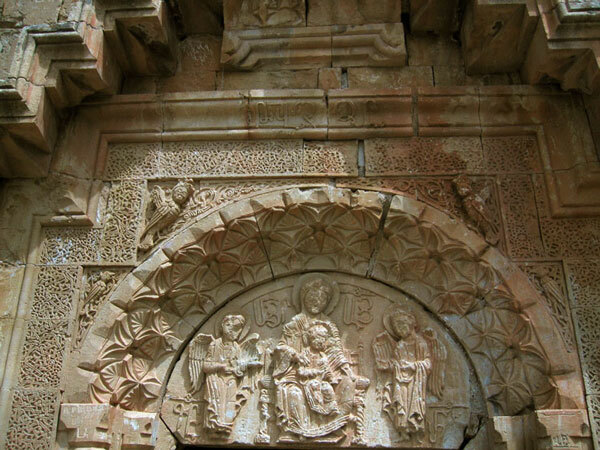 The entrance with an arched tympanum is decorated with columns, and the altar apse is flanked with khachkars and representations of doves in relief. The church of St. Karapet (9th-10th centuries), which has come down to us in ruins, is the most ancient monument of Noravank. To the north there is a vaulted sepulcher by the architect Stranes, and the jewel to the south is the two-storied sepulcher-church of Prince Burtel Orbelyan, built by Momik in 1339. It follows the composition style of 4th-5th century monuments. Noteworthy are the interesting reliefs on the tympant at the first circle (The Virgin and The Archangels Gabriel and Michael) and the second circle (Jesus Christ with the Apostles Peter and Paul), and the Orbelyan princes delivering a model of this church they underwrote to the Virgin Enthroned. Some of the 13th-14th century buildings, though in ruins, attract visitors, as does a particular khachkar carved by Momik, with a Deesis (now on deposit in Ejmiatsin). The gravestone-khachkar of Momik himself is also on the monastery premises.